Thursday post ~ Photographers and more Photographers from around the world. As you can see by the photos, ArtMuseDog and I have been taking advantage of the wonderful weather and meandering and sometimes racing (not me) on the beach. The first photo is for Alphabe Thursday (prompt) was Q so we have Queen of the Beach, quickly checking out every nook and cranny, quizzing with her nose, everything! The two photos below the Queen are for Rural Thursday and are of the beach again. September to me and sometimes October is when the beach is best. The ocean, the sand, the air are all very healing and inspirational to me and I feel at one with the universe. Each blog is filled with excellent photographers and amazing creativity so good for the 'spirit'. Do hope you have enjoyed our blog and will check out the other blogs. Enjoy. I agree about September and October and the beach! The weather is (usually) perfect and there aren't as many people! Queen of the beach! I love it! If you want to see what Lizzie does at the beach, go to my Facebook page. I have a couple of photos of my little squirt, as well as a photo of a cat who has adopted us. We named her Violet. That is the cutest Queen of the Beach ever! OH, how I love a visit to the beach. To just sit, relax, get my feet wet, feel the sand between my toes, breathe in the amazing smell of the ocean...SO rejuvenating! Your Queen is adorable! She looks like such a sweetie. 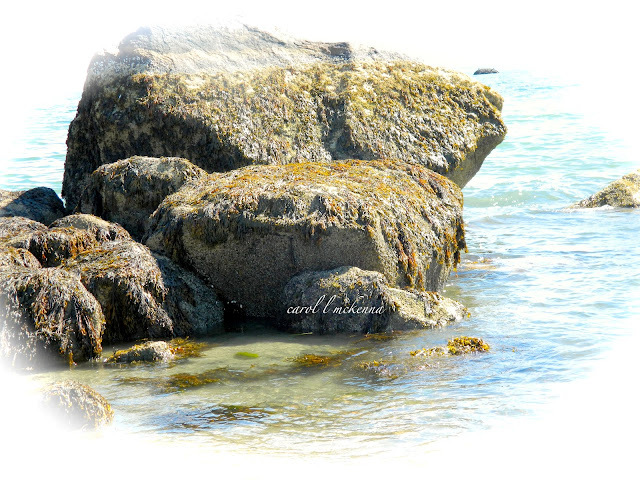 Your shots of the beach and rocks are great. Thank you. love those rocks on the beach! we don't have anything like that around here. cute queen! I would worship her. Your ArtMuse dog is an adorable Queen and looks right at home on the beach! 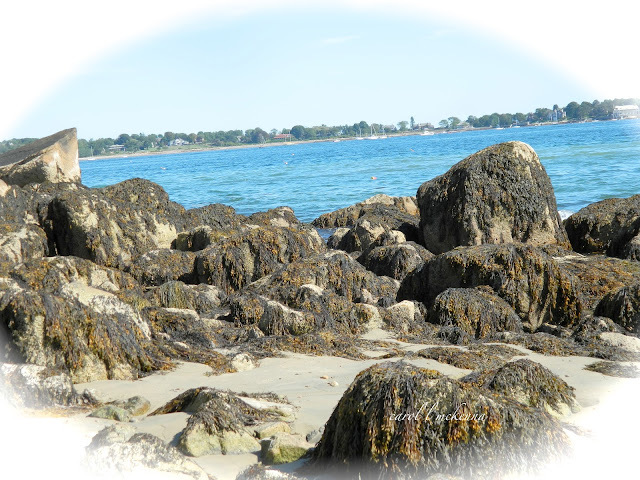 I also loved the shore rocks that are so full of character. It is so beautiful! I would love to spend some time on those wonderful healing peaceful beaches. Your little queen is amazing! Okay, your dog is the cutest thing EVER! And the photos are nice, too--wink, wink! It looks like a wonderful day at the beach. That is so nice to see the beach and dog enjoying. I love the sights and sounds at the water's edge. Love the photos. You got quite the partner. I just love the queen of the beach! 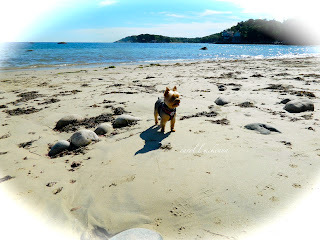 A lovely spot on the beach -- and a darling companion to complete the picture. I'm lovin' Queen of the Beach! I bet she had a great time! Each photograph is filled with so much excitement. I'd love to be close to a beach! I'd drive right there, after seeing your wonderful photos! But, the closest beach to us is the sand bar on the Mississippi River! I love the river--but it's just not the same. . . It's nice you live so close to the beach - September and October are beautiful for strolling the beach with a dog. It looks like ArtMuseDog "Queen" enjoys it as much as you do! I love being at the ocean in the fall! I'm trying to put together a trip to the Oregon coast this fall and not getting any cooperation! Popped in from Rural Thursday. Such beautiful photos! love the first one of course, so cute! I love the photos! The beach looks lovely and the little Queen looks in her element! Hugs to you and thanks for the share. Beautiful photos of the beach. Love your dog. He/she is so cute. The photos are nice, but I have to admit ArtMuse Dog stole the show...just look at that face...too cute! (lol) Thanks for sharing. Your Queen is a real cutie, I just love her! Beautiful images of the beach. Wishing you a happy weekend! These beach shots are breathtaking, Carol. Queen, artmuse dog, looks like she was having a delightful time too. Blessings! Thanks for letting me enjoy this quite lovely post! I feel like I had a mini vacation!